Dubai: The Victory Team of Dubai will once again be the challengers as the Team Abu Dhabi trio of Thani Al Qamzi, Erik Stark and Shaun Torrente head for dominance at the Grand Prix of India – the fifth round of the UIM 2018 UIM F1 H2O World Championship this weekend. Held on a 2.125km course on the Krishna River in Amaravati in the Indian State of Andhra Pradesh, it is the trio of Team Abu Dhabi drivers who have the edge over the rest of the field. The team running out of the Abu Dhabi International Marine Sports Club (ADIMSC) has taken the series by storm this season and Al Qamzi has landed in India defending a single point lead over Stark and a two-point lead over Torrente. The three drivers have been in awesome form while securing two successive top-three finishes and move well clear of their closest title challenger – three-time World Champion Philippe Chiappe of the CTIC F1 Shenzhen China Team. Al Qamzi, Stark and Torrente have also given Team Abu Dhabi a commanding lead in the UIM Teams’ Championship and Stark leads the Pole Position series by 13 points from Chiappe. 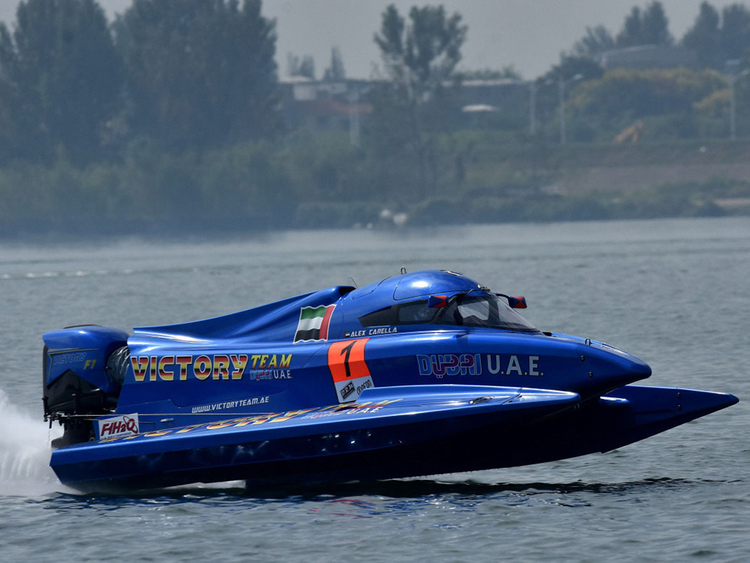 Victory Team’s Ahmad Al Hameli and four-time defending world champion Alex Carella are among those wanting to challenge the dominance of Team Abu Dhabi. Al Hameli is in sixth overall with 15 points, while Carella is tenth overall with nine points. “We didn’t have a good start to the season and that is the one aspect that set us behind the rest of the field. But with three races to go and a maximum of 60 points on offer to the winner, we could find ourselves in a totally different position after this weekend,” Huraiz Bin Huraiz, Chairman of the Board of Directors at Victory Team, rued. “We have had some time after the fourth race in China to regroup and do some more testing of the new boats. Now it is time to see this hard work coming through and helping our two boats move towards the top of the standings,” he added. F1 H2O boat racing is heading to India for the first time since Francesco Cantando won in Mumbai in 2004. After technical scrutineering and administration checks on Friday, teams will be permitted to carry out free practice from 3.30pm. Saturday’s timetable starts with F4 free practice and time trials from 10am, F1 free practice at 11.10am and the first of the two 20-minute F4 races from 2.30pm. BRM Qualifying starts at 3.30pm. Further F4 practice and time trials precede a third F1 H2O practice session on Sunday morning and the second of the F4 races, starting at 3.15pm. The Grand Prix of India is scheduled for 4pm (2.30pm UAE time).